William J. Jenack Auctioneers is one of the fastest growing auction galleries outside of New York City, offering fine art, furniture, jewelry, decorations and a variety of special interest categories. 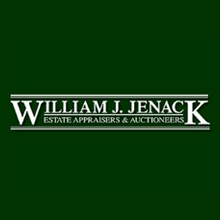 William J. Jenack Auctioneers, a privately held company, opened their doors in 1988 and has built a reputation of providing buyers and sellers with personalized service while offering national exposure through advertisements in trade publications, a mailing list of thousands of established customers and global exposure through the World Wide Web. Monthly auctions are conducted at our state-of-the-art facility in Chester, Orange County, NY just 55 minutes north of New York City. To reach us directly call (845)469-9095, Toll Free call (877)282-8503 or e-mail info@jenack.com. Our gallery address is: 62 Kings Highway Bypass, Chester NY 10918. After undergoing a major expansion, William J. Jenack Auctioneers is well equipped to provide the expertise, personalized service and professionalism with which we approach all aspects of our business. We are confident that our honesty, integrity, knowledge & commitment will offer both buyers and sellers the best auction marketplace opportunities.